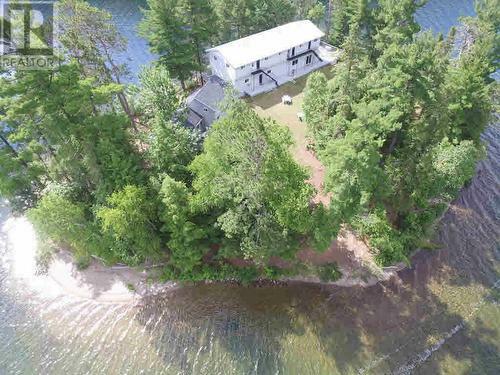 Luxury Wilderness Living on a PRIVATE island, approx 1.25 acres, situated in Lake Matinenda Park, an 8800 acre lake with extensive wilderness shoreline, in the heart of Northern Ontario. Two separate, fully equipped cottages (known as the Cabin and the Lodge), combined living space approx 5200sft, will accommodate a large family or groups up to 20 people comfortably. Small cabin offers income potential. Plenty of balconies and decks to relax on and enjoy the fabulous views of the lake and the park. From enjoying nature's tranquillity to boating, fishing, snowmobiling, hunting, swimming for the outdoor enthusiast, there is activity for everyone. Located halfway between Sudbury and Sault Ste. Marie, the island is easily accessible. The original smaller cabin, with its living area double height vaulted ceiling, woodstove, 2 bedrooms, private patio offers a cozy getaway from the hustle and bustle of the rest of the island. The main house, built in 1995, consists of 6 bedrooms, 2 with whirlpool tubs, 6 bathrooms, 2 separate washrooms, large community area, commercial style kitchen, laundry facility, workshop and usable basement is ideal for a large family or group, even corporate events. A new metal roof was installed in 2016. The island is powered by three generators (2.7kW, 37kW, 6kW), one 100Amp solar cell for the cabin, and connected to four septic tanks. Well maintained, all areas are furnished and equipped, ready for turnkey occupancy. This property for sale has been tagged by the seller as close to Elliot Lake, Ontario. Thank you for viewing this For Sale by Owner property in Blind River, Ontario.